We’d love your help. Let us know what’s wrong with this preview of Lightning Jack by Glenda Millard. To ask other readers questions about Lightning Jack, please sign up. Lyrical, highly imaginative story presented in a style reminiscent of Banjo Patterson and other old bush poets. There's even a lovely twist at the end. Evocative illustrations. I was fortunate to hear this read aloud last year by the author, which was a wonderful experience. Having said that, my ten-year-old daughter, who prefers the quick wit of the likes of Andy Griffith, found this story a little "slow". But for children with the patience to appreciate good writing and a finale Lyrical, highly imaginative story presented in a style reminiscent of Banjo Patterson and other old bush poets. There's even a lovely twist at the end. Evocative illustrations. Ethereal, poetic, historical, illusory, artful - Pure magic. A must. I have recommended this book because it is about a horse, and not just any horse, a wild brumby. This brumby stands out from the rest of the horses because it is a beautiful black horse with a lightning blaze on the top of its head. This horse is named "Lightning Jack". Sam Tully the main character is watching Lightning Jack and it seems that the horse is daring him to ride him, so Sam takes this dare. He mounts Lightning jack and they ride. Sam comes into contact with other characters of the bo I have recommended this book because it is about a horse, and not just any horse, a wild brumby. This brumby stands out from the rest of the horses because it is a beautiful black horse with a lightning blaze on the top of its head. This horse is named "Lightning Jack". Sam Tully the main character is watching Lightning Jack and it seems that the horse is daring him to ride him, so Sam takes this dare. He mounts Lightning jack and they ride. Sam comes into contact with other characters of the book and this is how his adventure begins. Sam's first encounter is with graziers. A grazier is an owner of a large property that handles sheep or cattle. The graziers are impressed with Sam's ability to heard on the back of this magnificent horse and offer to purchase the horse from him, but Sam refuses. This is not his horse to sell, he flies off with Lightning Jack like Pegasus. Next Sam encounters Ned Kelly who offers him a bag of gold for the horse but Sam refuses once again and Lightning Jack leaps away over a gorge with ease. They seem to have landed in a beautiful serene place, it seems like horse heaven to Sam. Here Sam meets Australia's most famous race horse Phar Lap. Together Sam and Lightning Jack take on Phar Lap, but.... there is a gentle voice calling Sam. We are pleasantly surprised that the story we are reading is in fact a story about a boy who is day dreaming . Sam has been on a merry go round the whole time and Lightning Jack is just a wooden horse. This is a story written in rhyming verse and creates a constant sense of movement throughout the story, which is needed for this galloping black beauty. As (Sedgwick 1997) tells us, there is a need for the education of imagination to our children and Glenda brings this imaginative rhyming verse to us. The illustrations are by Patricia Mullins and are done with tissue paper in the form of a collage. 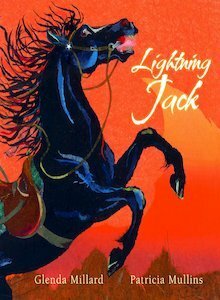 Patricia says"...I loved Lightning Jack from the first time I read Glenda's text and fell in love with her writing and, of course, the subject! The illustrations had to reflect the energy and emotion that Glenda captures so well." So how can I use this poetic narrative in the classroom. Students can create their own collages of their favourite part of the book with tissue paper too and place their own simple rhyme with it. This book had beautiful pictures that we all (children and educator) really enjoyed. The rhyme was patchy but not too bad. The story itself was quite likeable. The children didn't understand the Ned Kelly reference and asked me to interrupt the story to try to explain. So arguably a bit of Australian history in there but in a very shallow way. I found the ending beautiful and relatable but I am not sure the children "got" it. Evocative prose and illustrations, very reminiscent of Banjo Patterson's The Man From Snowy River. My five year old daughter needed quite a few of the words explained to her, but she enjoyed the adventures of Sam Tully and Lightning Jack. Haven't read a picture book with such powerful imagery in a long time! And then the artwork... Brilliant. My children pore over it too! Lovely rhyming with good rhythm when reading out loud. love how it pulled together unexpectedly but did have to explain it to my 6 year old. Stunning artwork by Patricia Mullins, an absolute joy to read. Glenda Millard was born in the Goldfields region of Central Victoria and has lived in the area all her life. The communities she has lived in and the surrounding landscapes have provided a rich source of inspiration and settings for many of her stories. It was not until Glenda's four children became teenagers that she began to write in her spare time. She is now a full-time writer. Apart from writin Glenda Millard was born in the Goldfields region of Central Victoria and has lived in the area all her life. The communities she has lived in and the surrounding landscapes have provided a rich source of inspiration and settings for many of her stories. Apart from writing, some of Glenda's favorite things are Jack Russell Terriers, hot-air ballooning, making and eating bread and pizza in the wood-fired oven that her husband built in the back yard, and reading books which either make her laugh or cry.